Gift vouchers are sent by email after you place your order. You can then forward them to your friends or print them out and give them a paper copy. You can also buy yourself a gift voucher to use when that special fruit tree comes into stock. Rather Vouchers Sent By Post not Email? 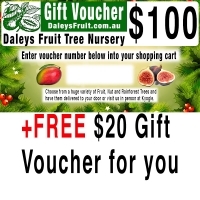 Get a Free Daleys Fruit Tree Reference Guide when sent by post. 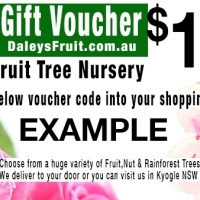 - You can buy a gift voucher along with other items in your basket. - You don't have to spend the entire voucher in one go the remaining amount can be used on another order. 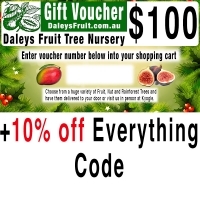 - Daleys Mail Orders Fruit Trees to NSW, QLD, VIC, SA, WA & ACT. Need to give a fruitful rewarding gift but don't want to face traffic and shops. 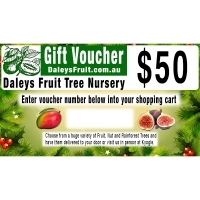 A Daleys Gift voucher can be purchased and delivered in under 5 minutes online. Question: Can Daleys Nursery print it out and send it to my friends Mailing Address? Answer: The Vouchers on this page are Email Only. So you will need to print them out yourself and send them to your friend. If you would like us to do this on your behalf we have another Voucher Page. Answer: Paypal, Visa and MasterCard allow you to get the voucher straight away. Direct Deposit and Cheque will mean you have to wait until the payment is received and processed. Question: Can gift vouchers be used on Pre Purchased? 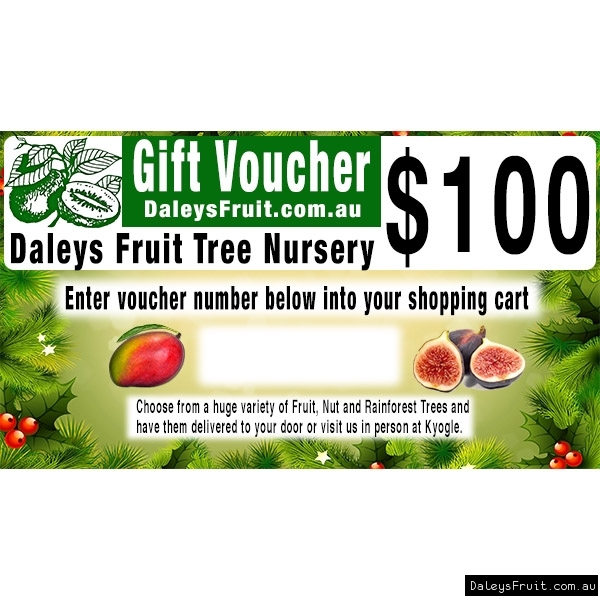 Answer: No, Gift vouchers can only be used on plants that are in stock and ready to be sent. 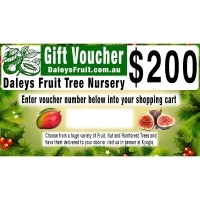 Question: Can gift vouchers be used on Wholesale Purchases? Answer: Gift voucher are for retail purchases only. Questions: Can I refund a gift voucher. Answer: No gift vouchers are treated like cash and are non refundable. 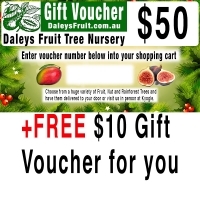 Question: Can I use my gift voucher on an order where I buy another gift voucher. Answer: They are meant as a gift but in some circumstances where the person isn't able to use it this is ok.
*No further discounts can be applied to vouchers.